Welcome to the Modern American Center in Freetown, Sierra Leone. The Modern American Center is co-located at the U.S. Embassy in Freetown in Southridge Hill Station. 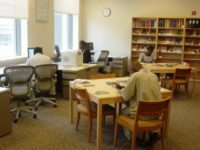 Members of the general public are invited to take advantage of our periodicals, books, computer center, and regularly-scheduled programming. The core-collection consisting of 1000 titles and 40 periodicals is available to the general public during regular hours. The Modern American Center provides Internet access to visitors for research purposes. Library membership is free to the public, inquire with the staff about how to become a member. Only card-carrying members can borrow books. However, all patrons are welcome to the IRC to read or do research. First time and casual users are advised to come during the above mentioned business hours and to bring a photo ID. Patrons may come to the center during opening hours for reference purposes. Under the guidance of the staff, these patrons will be shown how to find answers to their questions. The Modern American Center (MAC) Internship program 2019. Welcome to Africell American Corner in Freetown, Sierra Leone. The Africell American Corner is located at Africell Customer Care Office, 25 Bathurst Street, and Central Business District of Freetown, Sierra Leone. Members of the general public are invited to take advantage of our periodicals, books, computer center, and regularly-scheduled programming. The core-collection consisting of 700 titles and 20 periodicals is available to the general public during regular hours. The Africell American Corner provides Internet access to visitors for research purposes. Library membership is free to the public, inquire with the staff about how to become a member. Only card-carrying members can borrow books. However, all patrons are welcome to the Africell American Corner to read or do research. First time and casual users are advised to come during the above mentioned business hours. Patrons may come to the Corner during opening hours for reference purposes. Under the guidance of the staff, these patrons will be shown how to find answers to their questions. Welcome to Bo American Corner in Bo, Sierra Leone. The Bo American Corner is located at 1 Hardup Lane, Bo City Library, back of the Bo Central Police Station. Members of the general public are invited to take advantage of our periodicals, books, computer center, and regularly-scheduled programming. The core-collection consisting of 516 titles and 41 periodicals is available to the general public during regular hours. The Bo American Corner provides Internet access to visitors for research purposes. Library membership is free to the public, inquire with the staff about how to become a member. Only card-carrying members can borrow books. However, all patrons are welcome to the Bo American Corner to read or do research. First time and casual users are advised to come during the above mentioned business hours. Welcome to Kissy American Corner in Freetown, Sierra Leone. 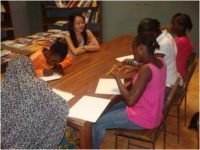 The Kissy American Corner is located at the Sierra Leone Library Board Kissy Branch, Old Site, Low-Cost Housing, Freetown, Sierra Leone. Members of the general public are invited to take advantage of our periodicals, books, computer center, and regularly-scheduled programming. The core-collection consisting of 1,700 titles and 20 periodicals is available to the general public during regular hours. The Kissy American Corner provides Internet access to visitors for research purposes. Library membership is free to the public, inquire with the staff about how to become a member. Books can only be consulted within the Library. Patrons are welcome to the Kissy American Corner to read or do research. First time and casual users are advised to come during the above mentioned business hours. Welcome to Fourah Bay College American Shelf in Freetown, Sierra Leone. The Fourah Bay College American Shelf is located at Fourah Bay College Academic Library, University of Sierra Leone. Members of the general public are invited to take advantage of our periodicals, books, and regularly-scheduled programming. The core-collection consisting of 250 titles and 20 periodicals is available to the general student body during regular hours. Library membership is free to the public, inquire with the staff about how to become a member. Books are only consulted within the library. All students and faculty staff are welcome to the Fourah Bay College American Shelf to read or do research. First time and casual users are advised to come during the above mentioned business hours. Students and staff may come to the Shelf during opening hours for reference purposes. Under the guidance of the staff, these students will be shown how to find answers to their questions. Welcome to Kenema American Shelf in Kenema, Sierra Leone. 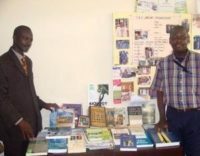 The Kenema American Shelf is located at the Kenema City Library, Mission Road, Kenema, Sierra Leone. Members of the general public are invited to take advantage of our periodicals, books, computer center, and regularly-scheduled programming. The core-collection consisting of 213 titles and 15 periodicals is available to the general public during regular hours. Library membership is free to the public, inquire with the staff about how to become a member. Only card-carrying members can borrow books. However, all patrons are welcome to the Kenema American Shelf to read or do research. First time and casual users are advised to come during the above mentioned business hours. Patrons may come to the Shelf during opening hours for reference purposes. Under the guidance of the staff, these patrons will be shown how to find answers to their questions. Welcome to Makeni Regional Library American Shelf in Makeni, Sierra Leone. The Makeni Regional Library American Shelf is located at Azzolini Highway, Opposite Ernest Bai Koroma University, Makeni, Northern Province, Sierra Leone. Members of the general public are invited to take advantage of our periodicals, books, and regularly-scheduled programming. The core-collection consisting of 200 titles and 15 periodicals is available to the general public during regular hours. Library membership is free to the public, inquire with the staff about how to become a member. Books are only consulted in the library. Patrons are welcome to the Makeni Regional Library American Shelf to read or do research. First time and casual users are advised to come during the above mentioned business hours. Welcome to University of Makeni American Shelf in Makeni, Sierra Leone. The University of Makeni American Shelf is located at the Fatima Campus, University of Makeni, Northern Region. Members of the general public are invited to take advantage of our periodicals, books, computer center, and regularly-scheduled programming. The core-collection consisting of 300 titles and 15 periodicals is available to the general public during regular hours. The University of Makeni American Shelf provides Internet access to students and university staff for research purposes. Library membership is free to students but the general public can also become members. Inquire with the staff about how to become a member if you are not a student or university staff. Books can only be consulted within the Shelf. Casual users are advised to come during the above mentioned business hours.